Proxima Centauri is the closest star to our Solar System. At 4.24 light years distant, it is the closest of a triple star system called the Alpha Centauri system comprising of two Sun-like stars at a distance of 4.38 light years, and Proxima Centauri, a red dwarf star residing about two trillion kilometres or a little under 0.2 light years closer to us, and in orbit of its two companions. In our night sky they are located in the southern hemisphere constellation of Centaurus. Given the detection in recent years of thousands of planets around other stars, called exoplanets, there has been a major aspiration to detect a planet around any of the three stars of the Alpha Centauri system. 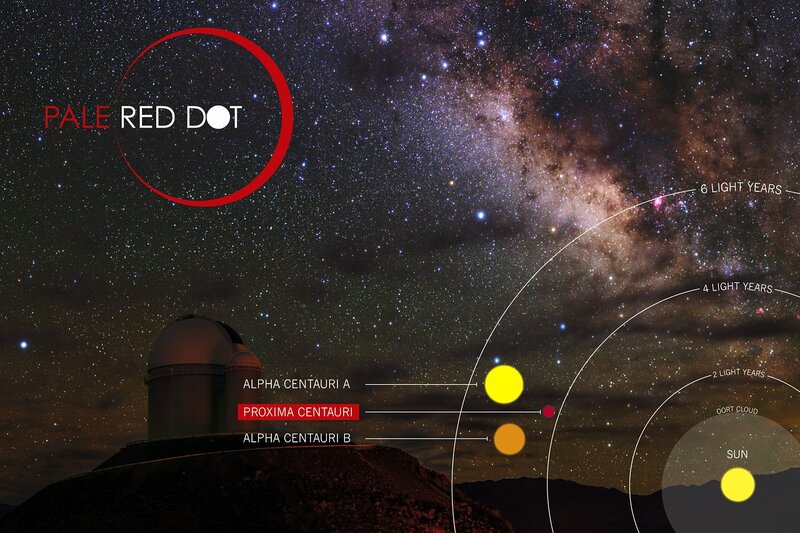 To this end, the European Southern Observatory (ESO), the largest astronomical institution in the world, set a science (and science-outreach) project in motion in January 2016 called PaleRedDot – a specific search for the existence of a planet exhibiting potential Earth-like characteristics around Proxima Centauri; and on August 24th 2016 the PaleRedDot consortium of scientists from the UK, Spain, Chile, the US and other countries published findings in the journal Nature that strongly indicates the presence of an Earth-sized planet orbiting Proxima Centauri. 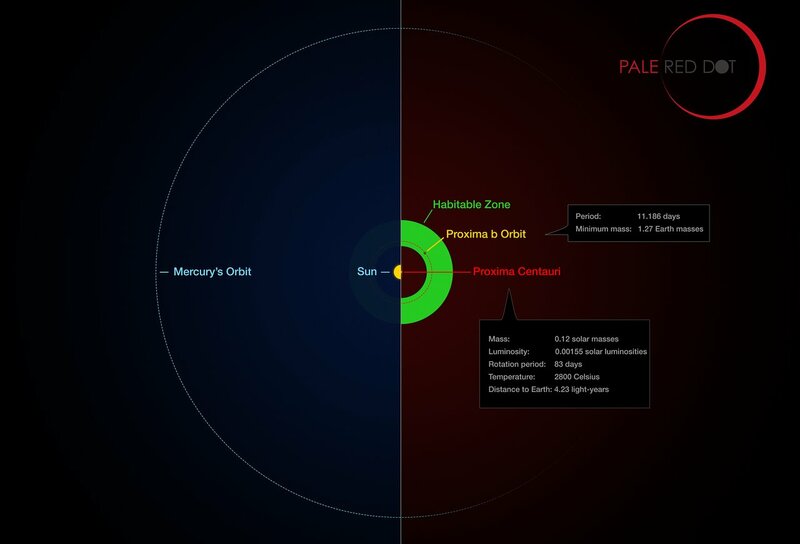 PaleRedDot has achieved success – within just months of its initiation! What is intriguing about this discovery is that the planet, currently designated Proxima B, is similar in size to the Earth at around 1.3 Earth masses, and also resides at a distance of 7.4 million kilometres from its cool red parent star within what is called its habitable zone – the region about the star that could allow any water on an orbiting planet to exist in liquid state. These characteristics make Proxima B a candidate terrestrial or candidate Earth-like planet. While details of the planet’s make up and surface conditions are currently unknown and none of the new evidence suggests any actual terrestrial characteristics, such is the rapid development of telescopes and analysis techniques that it is likely only a matter of a years before we gain sound insight into many of Proxima B’s characteristics, including whether any of its potential for terrestrial-like behaviour has been realised. And so this discovery marks the beginning of an intensive period of endeavour and discovery, heralds a new era in exoplanetary science given the proximity of the planet, that will surely lead to significant new insights into Proxima B in particular and planets and solar systems in general. With highly innovative technical proposals emerging for long range robotic exploration of the outer Solar System and beyond, the discovery of Proxima B also offers a new and unprecedented planetary target at our closest stellar neighbour, and will act as a major sign post toward the stars in the coming decades. We have our first confirmed planetary exploration destination beyond our own Solar System! Our Sun provides virtually all energy in our Solar System and Earth could not have given rise to or sustained life as we know it without its presence. At just one hundred and fifty million kilometres distance, the Sun is a very close neighbour indeed. All of the stars in the night sky are also suns, some much larger and hotter than ours such as the brilliant blue-white star Rigel in the constellation of Orion; with many others smaller and redder in colour and shining more dimly than our Sun. Such dim stars are called red dwarfs. By contrast our Sun is an in-between star – yellow in colour – and with a diameter of one million kilometres is unremarkable in size, mass and brightness when compared to the most massive stars like Rigel. Of the 400 billion of stars in our Milk Way galaxy, the vast majority (75%) are red dwarfs, while just 4% are like our Sun. Still, that’s approximately 16 billion Sun-like stars in just our galaxy. The distances between the stars are truly vast. While we measure the distances between the planets of our Solar System in tens or hundreds of million of kilometres, stellar distances are typically many trillions of kilometres. Such distances are truly gargantuan and so the light year has been adopted to indicate the distances between the stars, where one light year is the distance travelled by a ray of light in one year – 10 trillion kilometres (well, 9.6 trillion km). Our Milky Way galaxy, containing upwards of 400 billion stars, is a flattened disk extending more than one hundred thousand light years, and with a central bulge more than twenty thousand light years in thickness. In the quest to fully understand our Milky Way galaxy and the Universe in general – and our place in the greater scheme – we have always wondered whether the far off stars are accompanied by planetary systems. But with such vast distances to contend with, evidence of planets around other stars, called exoplanets, has been beyond our detection capabilities until quite recently. Over the past twenty years however, telescopes, detectors, computers and analytical techniques have improved so radically that we have been able to detect planets around many stars. And so today the detection of exoplanets is one of the most active fields of science, involving the World’s great telescopes such as the European Southern Observatory located in Chile, and space probes such as NASA’s Kepler Exoplanet Detector and the Hubble Space Telescope. As of the time of writing, approximately 3500 exoplanets have been confirmed, with new planets being discovered on a near daily basis. Such has been the transformation of the detection and study of exoplanets that by now we have even achieved the first tentative census of planets in the entire Milky Way galaxy; and the numbers are staggering. For example, we are confident that almost every star in the galaxy has at least one planet, so that makes for a minimum of four hundred billion planets, and the full count is likely to run into the trillions. It is estimated that there may be upwards of 30 billion Earth-sized planets in the Milky Way (note – ‘sized’ not ‘like’) and intriguingly we suspect that of the 16 billion Sun-like stars in the Milky Way, one in five of those has an Earth-sized planet residing in its habitable zone. That makes for about 3 billion stars like our Sun each with a planet the size of the Earth residing in its habitable zone, in just our Milky Way galaxy alone. Detecting exoplanets is an extraordinarily challenging business even today. In most cases, our largest telescopes are still not powerful enough to actually see planets around other stars directly; and so we have had to develop sophisticated techniques to indirectly detect the existence of exoplanets. Of the many techniques available, two stand out for now. The first is called the Transit Method. Here, we monitor a star’s brightness over a prolonged period of time, and if a planet happens to be orbiting the star along our line of sight, we should see the star temporarily dim in brightness as the planet passes in front of the star. The Kepler space probe has detected all of its exoplanets using this method, but as powerful as this techniques is, it only works if the alignment is right – and it’s only right for a few percent of all stars visible form Earth. The second method is called the Doppler or Radial Velocity method. Here, we monitor changes in the spectrum or detailed colour of the star as it wobbles, where the wobble is caused by a nearby orbiting object such as planet. As the star wobbles toward us we see it more blue, and as it moves away from us we see it more red. The changes in colour are minute, but they are detectable, especially stellar wobbles caused by large Jupiter-sized planets orbiting their parent star. Of course one of the fundamental quests for humanity is the two-pronged question of the origin of life on Earth and the cosmic abundance of life. With so many astounding advances in science, answers to those questions have remained frustratingly elusive. But with the development of exoplanet detection we can begin to open new avenues of investigation, most especially in the search for planets like our own that might harbour life. And so the search for both Earth-sized and Earth-like planets has become a hot pursuits in science today. While planets of Earth size may reside anywhere in a given solar system from the scorching inner regions to the frozen outskirts; Earth-like or potentially Earth-like suggests a planet of similar mass and make-up to Earth residing in a particular region of its solar system called the habitable zone – a relatively narrow zone around the star where liquid water may exist on the planet’s surface. Such a constraint renders the detection of such planets incredibly challenging, and as already indicated, so new are even our best detection techniques that the best we can hope for today is the detection of potential or candidate Earth-like planets, with actual confirmations of any present Earth-like characteristics being some years off. Nevertheless, significant progress is been made of late, and currently, of the 3,500 known exoplanets, about 600 are known to be Earth-sized, with approximately 40 of those being candidate Earth-like planets. So while the search for candidate Earth-like planets is making ground-breaking progress, detailed examinations of the currently known potential Earth-liked planets remains firmly beyond our capabilities for now. But lets not forget about those 75%, or upwards of 300 billion red dwarf stars in our galaxy. While they are smaller, cooler and dimmer than the Sun, they are enormous in number, and each can of course possess a habitable zone, however close to the parent star that might be. And so of late there has been renewed interest in investigating red dwarfs too in the search for Earth-like planets. And while as indicated we have already detected about 40 potentially Earth-like planets, including red dwarfs in our search opens up one significant avenue of investigation – our closest stellar neighbour Proxima Centauri. The three closest stars to us – the gravitationally bound Alpha Centauri system – resides at a modest distance (on stellar scales) of just over 4 light years. While that’s still 40 trillion kilometres and currently too far to reach by space probe (the New Horizons space probe which took 10 years to travel to Pluto would take over 60,000 years to reach Alpha Centauri); nevertheless the three stars of the Alpha Centauri system are close enough that, if they contain exoplanets, we could determine the characteristics of those planets using our best current and near-future planned Earth-based observation techniques; and that would be a major break-through in exoplanet studies. Of the three stars in the system, Alpha Centauri A and B are both very similar in age, size, mass and colour to our Sun. Nevertheless, given that they orbit each other at a distance equal to the distance of our Sun to the planet Saturn, Alpha Centauri A and B constitute a wholly different kind of system to our own. We can already tell there are no Jupiter-sized planets orbiting those stars for example, and while tentative evidence exists for an Earth-sized planet orbiting Alpha Centauri B, there is much debate on the interpretation of the available evidence. Proxima Centauri on the other hand orbits both Alpha Centauri A and B at a distance of about 2 trillion kilometres, and indeed currently resides about two trillion kilometres closer to us than its stellar companions. It is a lot smaller than its far off stellar companions – a little larger than the planet Jupiter, but having accumulated more than 125 times the mass of Jupiter during its formation it was too massive to remain as a planet and became a red dwarf star, albeit with a luminosity far fainter than its companions or our Sun (about 0.0017 the Sun’s luminosity). 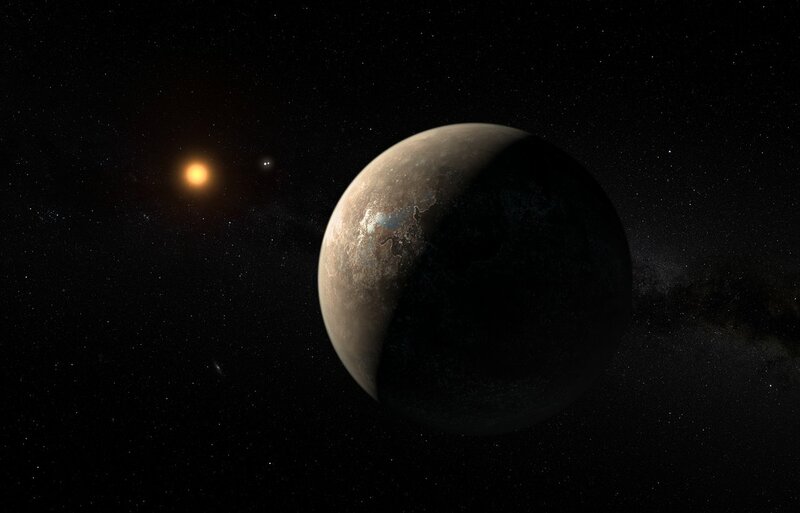 With a pressing desire to detect any planet close by and a potential Earth-like planet in particular, the European Southern Observatory decided in January 2016 to initiate a project to see if we could detect any Earth-sized planets orbiting Proxima Centauri. The project was given the apt title PaleRedDot, a play on the famous “Pale Blue Dot” phrase coined by Carl Sagan upon seeing an image of the Earth as a tiny pale blue dot in a Voyager 1 photograph taken in 1990. PaleRedDot set itself the challenging task of identifying whether there are any small planets orbiting Proxima Centauri using the Doppler method. This is challenging because the Doppler method is best suited to detecting Jupiter sized planets rather than Earth-sized planets which only causes a minute wobble of their parent star. But given the closeness of Proxima Centauri, it was deemed worth the attempt. And so the ESO consortium, lead by astronomer Guillem Andlada-Escude of Queen Mary University UK, initiated their search in January 2016, accompanied with a high profile science-outreach campaign allowing anyone to look in online at the project and see its progress. And to the amazement of all, the data gathered in just ninety days from January to March 2016 was sufficient to confidently identify the existence of at least one planet orbiting Proxima Centauri. Most extraordinary of all is that the planet, designated Proxima B, has been found to have a mass at least 1.3 Earth masses, making it likely Earth-sized; while its orbit about Proxima Centauri is a close orbit of just 7.4 million kilometres distance. 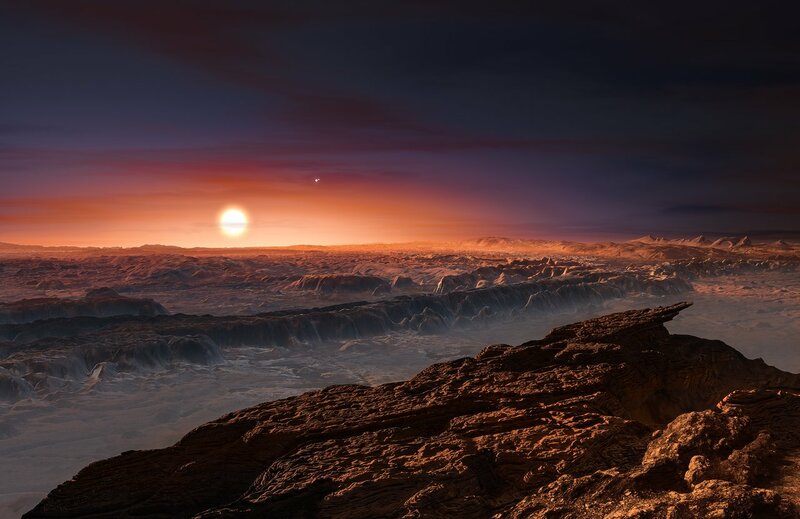 Given the star’s cool atmospheric temperature of 3000K, this sets Proxima B within the star’s habitable zone, making it a potential or candidate Earth-like planet. While such a close orbit may sound somewhat bizarre, it is worth remembering that Proxima Centauri is just 1.3 times the diameter of the planet Jupiter; where Jupiter’s outermost Galilean moon Callisto (itself about the size of the planet Mercury) orbits Jupiter at a distance of just two million kilometres. So Proxima B’s orbit of 7.4 million kilometres distance may be small by Earth-Sun standards, but for the Proxima Centauri system, it is just fine. This PaleRedDot project has been an overwhelming success, and its discovery of a candidate Earth-like planet orbiting our closest stellar is truly significant. While Proxima B resides in the habitable zone of Proxima Centauri, it must be made clear that the evidence accumulated to date provide absolutely no insight into the characteristics of Proxima B, other than that it’s a rocky planet at least 1.3 time the mass of the Earth residing in its parent star’s habitable zone. No information is currently forthcoming on the material make-up of its surface, whether is has an atmosphere, volatile systems including water, or on its actual habitability. Indeed, there are some issues mitigating against clemency and stability that we are already aware of, such as that Proxima B’s rotation is likely tidally locked to its orbit (like the Moon which only shows one face to Earth at all times), and hence the dark side of Proxima B never receiving any direct sun light at all; as well as other issues associated with Proxima Centauri itself such as its very powerful magnetic field, the fact that it’s a flare star and associated disproportionately strong X-Ray emissions. None of these can be claimed to be fatal to life supporting systems on Proxima B however – indeed the fact that it resides close to such an energetic star makes for a potentially very interesting environment because it will likely be a dynamic world in non-extreme ways (on a cosmic scale), and likely not dormant as with many of our Solar System’s large moons, for example. And so the discovery of a planet orbiting out next door neighbour will provide for opportunities to investigate a planet orbiting a different kind of star to our sun in unprecedented detail. When techniques improve, likely within just years, we will determine it’s material make up, atmospheric and other volatile material systems, interaction with parent star, presence of other planets and moons and other dynamisms on the planet and within its system. Already the available data tentatively suggests a second planet in the system with an orbit somewhere between 80 and 600 days, though it must be restated that the evidence is tentative. At a minimum we can be optimistic that Proxima B will be a very interesting and dynamic world, and if it happens to involve liquid water and other planetary volatile material systems, it may turn out to be of fundamental importance to our quest for origins and the cosmic abundance of life. By all measures, the importance of the discovery of a candidate Earth-like planet orbiting our closest stellar neighbour cannot be overstated. As just described, if it turns out that Proxima B is Earth-like, it will provide significant new insights into the age old questions of origins and the cosmic abundance of life. And in the context of our push to the far outer reaches of the Solar System with New Horizons to Pluto and into the Kuiper Belt, and the development of NASA’s Space Launch System (SLS) in 2018 which could deliver spacecraft to Pluto in just 3 years and will likely enable deep space missions to the Kuiper belt beyond Pluto; the discovery of Proxima B offers the coming generations of space explorers a major new destination to aim for. It may seem far fetched to us today to contemplate sending a space probe there, but it is likely that in the next few decades new mechanisms to send small space craft to the nearest stars will begin to emerge. The discovery of Proxima B will contribute fundamentally to that push, because it offers a destination to aim for. What has been until now a notion of travelling to unknown destinations among the stars becomes a tangible mission to reach a specific planet in the Proxima Centauri system. There cannot be a closer target beyond our Solar system, and such tangibility will likely precipitate into a specific and targeted mission over the coming decades. We can be confident that all involved today in spawning projects to reach the nearest stars in the coming decades will be transfixed by this discovery. As just two examples, currently in the US both NASA and DARPA are considering interstellar travel within the next 100 years; while Russian Entrepreneur Yuri Milner has donated no less than 100 million dollars to develop tiny space probe technology through an initiative called Breakthrough Stardust that could enable tiny robotic probes to travel to the Alpha Centauri or Proxima Centauri in just 20 years. In a nutshell, we now have a destination planet orbiting our next door neighbour; and that will surely spur on innovation for the coming decades in space exploration. As ground-breaking as the discovery of Proxima B is, it represents only the very beginning in a new era of both exoplanetary studies and of interstellar space exploration. We could not ask for a better scenario in the study of candidate Earth-like planets; while the presence of this planet sets space exploration onto a whole new path beyond the Solar System. And so many new astronomical studies of Proxima Centauri, and indeed of all our nearest stellar neighbours, are already ramping up. 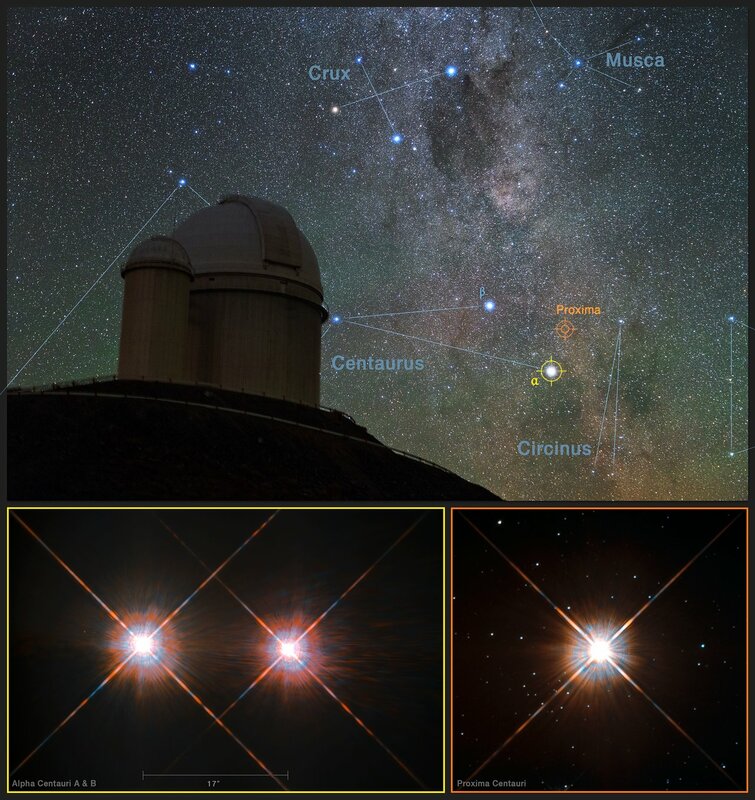 PaleRedDot will now aim at improving our understanding of the Proxima Centauri system and Proxima B, and will also continue into the future to study many near by stars. More broadly, exciting new missions about to get under way such as the next generation space telescope (called the James Webb Space Telescope JWST), the new TESS Exoplanet Finder both due to launch in 2018, as well as the development of ESO EELT – a gigantic telescope to see first light in 2024, among many other projects; all mean that Proxima B will come under intense scrutiny in the next few years, and will surely give up its secrets as to its characteristics and whether it is, or is not, Earth-like. The discovery of Proxima B heralds a new era in exoplanet studies and space exploration, and is likely to become a very important, and very familiar world to us in the coming decades. Acknowledgment: thanks to Will Goodbody, Science and Technology Correspondent, RTE, for laying the groundwork for this blog. That is amazing. Thank you for sharing that information and your insights. As the song says, let’s hope “that there’s intelligent life somewhere out in space, ’cause there’s bugger all down here on Earth”. Many thanks for this which is extremely useful. I’ve detected a handful of typos, and can send them on to you if you like, tho perhaps you’ve already corrected them?